Via Carlo Cattaneo, Brescia Italy, from my flickr photos. Downtown is for People is simply a wonderful article. It’s shocking to read how clearly Jacobs describes what’s good and bad about cities and planning. I was particularly impressed by the end of the article where she says citizens can and should play an active role in planning – how’s that for contemporary thinking? Imagine how we could use today’s information technology to help improve this process (for example, my GreenCityStreets.com project)? She also describes how planners often think in terms of blocks (because it’s easier) when they should be thinking about streets … what a simple, but powerful idea for making better places. Her description of Rockefeller Center and its streets is eye-opening. 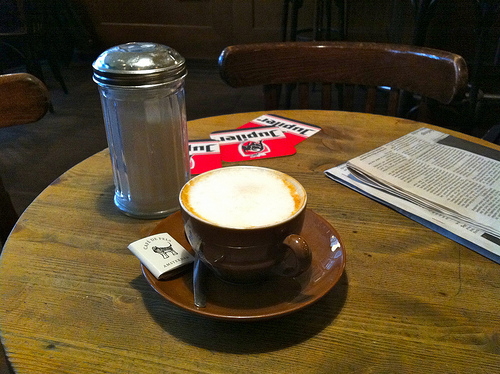 Jacobs tells her readers to walk, walk, walk … observing the city as they go. This is how you learn what works and doesn’t work in a city. It’s very much the philosophy of Allan Jacobs, one of my teachers at UC Berkeley – he told us look and measure, that’s the way to understanding. 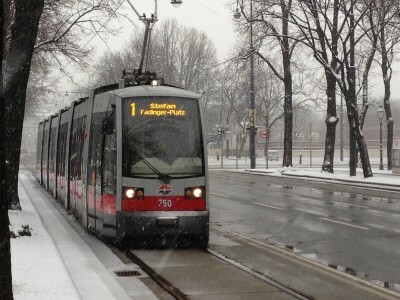 Vienna Ringstrasse tram in the snow. I attended a fascinating lecture and roundtable Wednesday night called Stadt der Zukunft (city of the future) organized by the city of Vienna and Erste Bank. The evening focused on urban mobility. The keynote speaker was Professor Andreas Knie from Berlin. His lecture was followed by four presentations from businesses working in the field of urban mobility, then a roundtable discussion with Knie, Vice Mayor Renate Brauner, Vice Mayor Maria Vassilakou, and Emeritus Professor Hermann Knoflacher from the TU Vienna. Societal Change) and a professor at two universities in Berlin. His lecture was titled: “Networked Mobility in Cities” slides from the lecture (German). Knie’s main focus was the need for integrating all forms of transport into easy to use networks. This means, for example, a single smart card that can be used for public transport, city bike rental, car sharing, buying things in stores, etc. 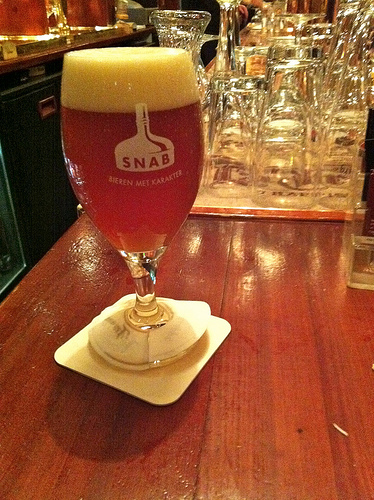 Knie reviewed some of the more famous examples (Hong Kong Octopus, London Oyster, Netherlands travel card, etc. ), as well as some German experiments (Berlin Mobility Card). One of the main reasons for developing these integrated cards is to create a networked transport system that can provide a similar degree of “automobility” as automobiles provide today. It’s clear that we will be using automobiles totally differently in 25-years (or sooner!). There is simply no way that the auto will be able to provide transport in rapidly growing cities (congestion). It will be necessary to use the right mode of transport for each trip, without necessarily owning the vehicle. We are seeing the beginnings of this revolution now, and it’s no secret that automobile companies see the writing on the wall, that’s why companies like Daimler are sponsoring car sharing companies like Car-to-go. So, we need to focus on developing these integrated smart card (or maybe mobile phone) systems. But, this will take time since people’s transportation habits are quite ingrained (we like our routines). For example, the Berlin Mobility Card was a truly exceptional offer (full use of the city-region public transport system, free use of rental bikes, 50 Euro credit for car sharing, all for the price of 78 Euros per month, and despite a large marketing effort, they had about 135 people sign-up (of course it was only for a 3-month trial, but still …). So change is hard. 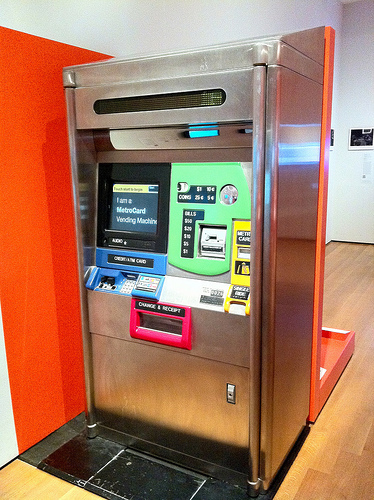 New York Subway ticket machine at MOMA exhibition Talk to Me. Introducing smart cards for public transport systems only has also been hard. Early systems were introduced probably two decades ago, but they are only now becoming popular in the USA. I saw a great presentation by Renee Matthews at the US TRB Meeting this year on the introduction of smart cards at the Tri-Rail in Florida (South Florida Smart Card). She gave lost of practical information in her presentation. As an aside, I’ve always thought it was sad that ski areas in Austria have better ‘fare collection’ systems and more information on their customers than most public transport agencies. This leads to another of Knie’s points, the private sector is much better organised to introduce these improvements than public agencies. And, as evidenced by, e.g. Car-to-Go, they are doing so. His point, to me, was not that public transport needs to be privatized, but rather that public agencies need to become more entrepreneurial. Knie talked a lot about the future for electric cars. He pointed out that they were expensive to buy and operate, and furthermore they would remain expensive. Electricity will not be free and developing renewable energy sources will be a big challenge. But, these conditions mean that electric cars are ideal for using in shared systems (e.g. Paris car sharing). Electric cars could also be used as batteries to store electricity generated using renewable sources, since these sources are dependent on wind, sun, etc. and not always available. I’d heard this argument before, but Knie’s version made more sense, since he linked it to the communal idea: thinking about the cars and electric grid as a shared system, not as individually owned vehicles. The most interesting aspect of Knie’s analysis of electric cars was the idea that using shared electric cars would start to bring about a change in the ‘transport-space’ concept we carry around in our heads. In other words, because these electric cars will be more expensive to operate and will have limited range, we will shift from a mindset that accepts long travel distances as a tradeoff for less expensive housing (in distant suburbs), to a mindset that looks for proximity and short trips. And, naturally, short trips are ideal for more environmentally friendly modes like walking, biking and public transport. Projections are that cities will grow significantly in the coming decades, it will clearly be impossible for everyone to have a car and live in the suburbs, so this change in mindset will be very important for future prosperity. Where will sustainable transport systems be developed? A particularly interesting point for me as an American was Knie’s discussion of where these new sustainable transport systems will be developed. Knie pointed out that the ongoing “renaissance of European cities” (for example in the sustainable transport sector), seems to be impossible in the United States because the society is politically not willing to invest in infrastructure. Many US cities seem almost to be imploding, especially when long-term maintenance of physical infrastructure is considered. In contrast, Europe still has a tradition of building large infrastructure projects in cities. This will be helpful to the economy as it’s a great opportunity for cities to become leaders in new sustainable transport technology. Cities that invest in new infrastructure and ideas will be able to sell these technologies elsewhere. IBM: Smart Mobility – two examples from IBM’s Smarter Cities program: Singapore’s fare collection card (important not only for simplifying fare collection, but also gives planners a very important set of data for improving service) and Carbo-Traf (EU research project) designed to reduce emissions by predicting congestion and informing drivers in time to make changes in travel patterns. Siemens – Described a new zero-emissions bus they have developed and are testing in Vienna. KTM Bikes – Austrian bicycle manufacturer has seen huge increase in demand for electric bikes, described the design for a new electro bike that can be used for shopping (can carry 150 kg, “That’s seven and a half cases of beer.” … and it looks pretty cool too). Vienna Stadtwerk – This is the city of Vienna’s holding company for the WienerLinien (public transport agency), power company and other services provided in the city of Vienna. Ilse Stockinger described the comprehensive e-mobility on demand project. The project idea is based on: more variety, more flexibility, more interconnectivity and more space for people. Vienna believes that the ideal coordinating agency for this type of a transport future are public transport operators and are looking at how to evolve to become this kind of agency. Neat idea. The last part of the evening was a podium discussion where Knie was joined by Vienna city government officials Vice Mayor Renate Brauner and Vice Mayor Maria Vassilakou, and emeritus professor Hermann Knoflacher (TU Vienna) to discuss how Vienna was doing in terms of sustainable mobility. Here are some of the points that made an impression on me, the Stadt der Zunkunft has an excellent summary of the discussion too (Stadt der Zunkunft German). Vice Mayor Brauner mentioned that not only is Vienna’s excellent public transport highly appreciated by residents, but, the availability of safe, convient and affordable public transport is the number 2 quality mentioned by tourists in what they like about Vienna (imagine this in your city!). She also reminded the audience that according to FastCompany, Vienna is the world’s #1 smart city. Professor Knoflacher emphasized the importance of not forgetting about pedestrians. 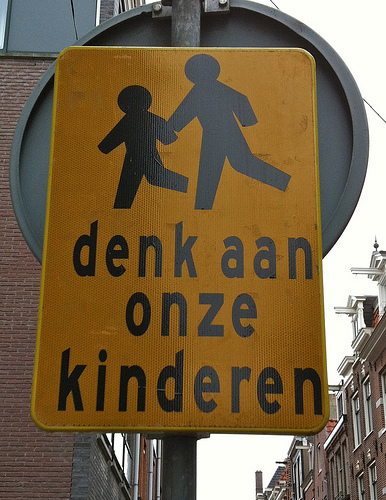 Good places to walk are needed for all the networked transport ideas described by Knie. Vice Mayor Vassilakou said a big problem in Vienna is that over 350,000 people drive into the city from the suburbs every day. Parking control and better regional public transport is needed (e.g. S-Bahn regional rail service). Professor Knie at this point played the devil’s advocate and suggested that while Vienna was doing very well, if the city really wanted to make a major change, then Vienna needs to completely re-invent public transport. Public transport operators must really know their customers, make their services attractive to people who don’t now use PT, and change the way people think about public transport. In response to Knie, Vice Mayor Brauner said that the WienerLinien was, through programs like the e-mobility on demand, QANDO real time mobile phone application, new lines and new tram vehicles, continually re-thinking public transport. She pointed out that the WienerLinien has over 350,000 customers who buy annual passes and they certainly know these people. Vice Mayor Vassilakou pointed out that everyone is now allowed to take their bikes on WienerLinien U-Bahn lines for free now (previously those without a yearly pass had to pay an extra fee). 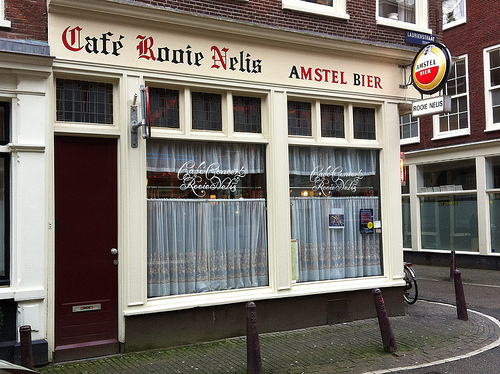 This is just the type of interconnected network that Knie was advocating. Professor Knie then suggested that Vienna could learn from other cities in the introduction of a single mobility card that could be used for all forms of transport. Another important point is that cities need to consider how they can get their residents to support the complex and controversial activities needed to create truly sustainable transport systems. It’s possible that government-run public transport agencies are not up to this task, the private sector should be more involved. Vice Mayor Brauner strongly objected to private control over services like public transport which are needed to make cities function for everyone. She pointed out that the WienerLinien is owned by Wiener Stadtwerk, a private company, but controlled by the city. This means it can be innovative (as evidenced by the innovations described above), but remains focused on providing the best for city residents. All four speakers were asked to describe their wish for Vienna in 20-years. Professor Knie: Public transport is the hub of an interconnected sustainable urban transport system. Professor Knoflacher: No more infrastructure would be built for automobiles, the only ones using cars would be disabled persons and deliveries. There would be more people living in Vienna and many fewer cars. Vice Mayors Vassilakou and Brauner both agreed that Vienna would reach and surpass the goal of 75% sustainable transport mode share by 2020 in the city’s Transport Master Plan. Vienna would also continue to develop and implement innovative new transport ideas and remain the world’s most livable, and smartest city. For more information see the excellent website (in German) from the event. Friedmann responding to a question. It was a great honor to hear Professor John Friedmann speak at the Technical University of Vienna last week. The lecture was fascinating. Here are some of my notes, they are incomplete and the lecture was so full of information that I am sure I got some of it wrong. You can get a copy of the full lecture from the lecture organizer. Friedmann’s lecture was structured around nine Austrian “cultural emissaries” who left Vienna for the outside world and directly influenced his thoughts about planning. The nine are: economists Bertram Hoselitz, Friedrich Hayek, and Joseph Schumpeter; the sociologist Karl Mannheim; Martin Buber, a philosopher and Judaic scholar; Ludwig Wittgenstein, a philosopher of language; Karl Popper, a philosopher of science; Paul Feyerabend, also a philosopher of science and a critic of Popper; and Karl Polanyi, an economic historian and social anthropologist. Although Friedmann did not agree with all these thinkers, they all influenced his work. Planning could be thought of as an intellectual pursuit, not just a profession. Democratic planning could be a 3rd path between totalitarian fascism and soviet communism. Planning is a condition for democratic life, the national state could and should intervene in the market for the benefit of society as a whole. Belief in the possibilites of a constructive democratic planning by the state. Succession Vienna, walking to the lecture. Social state management is a recipe for disaster. Strongly opposed to all forms of planning and state intervention. Planning is a socialist plot. Hayek’s thinking became a model for Margaret Thatcher, his book “a bible she wielded like a battle ax”. Focused on the role of cities in economic development: growth pole, world city, urban centered regions. His work in development studies and the role of cities strongly influenced Friedmann. Earlier work had been on the theory of economic development. Innovation in economic production and the idea of entrepreneurship took off from his work. Friedmann linked this concept to Hannah Arendt‘s idea of “action” (handeln in German) by which she meant “setting something new into the world.” For Friedmann planning is pragmatic or institutional innovation … not regulation and control (which is simply administration). The idea of negative entropy comes from Erwin Schroedinger: What is life? (1944) another Viennese. After graduating from the University of Chicago in 1955, Friedmann worked as a development specialist in South America, South Korea and Japan (Ford Foundation, USAID, etc.). He also taught at MIT and in 1969 started teaching planning at UCLA where he remained until 1996. Friedmann’s book “Retracking America” was published in 1973. It grew out of his experience working on development in South America, it caused him to re-think the idea of planning. Friedmann’s idea: planning is a relationship between knowledge and action, it requires dialog. A form of utopian planning based on local citizen participation. Karlskirche, walking to the lecture. Friedmann’s idea of transactive planning was influenced by the idea of dialogue and mutuality in Buber’s book. He was also influenced by Buber’s idea of utopia, but Friedmann believes that utopias need to remain small. To Friedmann, innovative planning is inconceivable without a utopia in your imagination. Critical connection between knowledge and action. Ultimate certainty (truth) is attainable. To Friedmann planning = a science but also means being actively engaged in making change, so: … What knowledge is sufficiently reliable for the practice of planning? How do we get it? Started as a student of Popper, but rejected Popper’s idea of certain truth. Methods cannot be prescribed, results are what ultimately matters = pragmatism. Multiplicity of knowledges, no single objective knowledge. Idea of social or mutual learning. Friedmann’s book “The Good Society” was directly influenced in content and form by Wittgenstein’s Tractatus Logico-Philosophicus book. A foundation of thinking about a form of planning not organized by the state. Moral basis of social practice, ethics. Friedmann had returned to the more manageable idea of development planning, particularly in the developing world. During the 1980s the idea of large government intervention in development was being replaced (partly as a result of Thatcherism) by the idea of small NGO-based programs. But NGOs cannot deal with the huge structural problems in many developing countries. It was during this period that development planning lost its scheen. Polanyi’s book described development freed from the language of classical economics, … “Disposable labor is allocated between the production of use values in the moral economy and exchange values in the capitalist economy.” Focused on the household as a social institution rather than a utility maximizing individual. Led Friedmann to the concept of social empowerment and a view of poverty defined as a lack of access to the bases of social power (Empowerment: The politics of alternative development). National boundaries no longer explain much. Planning is an innovative activity following Hannah Arendt’s definition … innovation is sending something new into the world. Planning = the relationship between knowing and acting. Acceleration of human and social change = the acceleration of local history. Planning is a dynamic pattern of interacting forces, but it’s almost impossible to see these forces. In China planning is more of a ritual activity rather than a guiding force, change is happening too fast for the existing planning structure to keep up. Planning theory = part of a theory of socio-spatial change … planning is normative, but history just goes on. Organized civil society = Friedmann’s hope for the future. A tacit knowing is needed, but how do we get it? To Popper knowledge was ‘free floating’ somewhere above us, if only we could find it. But, when we do find it, is it true? We know much knowledge today is generated with a point of view (cigarette company funded health research) … so, what’s the truth? Our interest as planners is to change the world, not to look for the ultimate truth (where ever this ultimate truth is, we can be sure we won’t find it). Knowledge is related to where we stand, knowledge and belief are closely inter-tied. There is more than one kind of knowledge, who can dismiss knowledge that is based on experience, or religion? We need to embrace a plurality of knowledges (note plural) to start a conversation on how to change the world for the better. Principle of dialog won’t go by the wayside. We need to analyze information to understand its meaning. To gain knowledge we need to work through the differences. In a city with many differences we can either give up on the idea of common good and everyone can be out for themselves (pure capitalism) or work through our differences (through dialog with planners acting as facilitators). Note that this is a very different role for planning than Master Planning from on high. Example of Vancouver BC waterfront planning process = extensive resident dialog, it was not a plan dropped on the city from heaven. Planning must be communications-based – why? It’s transactive particularly if you want to add other groups to the dialog beyond the state. Civil society is key. Friedmann hopes for innovation based on ideas coming from civil society. An analysis of needs with a democratic ethos. Hope for a better world is to learn to live with in our means (Greece is a good example when we don’t live within our means) … this will mean substantial change in the next 50 years. We need to change the question we ask about cities … in planning we never have enough knowledge, we are always taking risks because we don’t know the future … we need to act on assumptions and then act again after seeing the results. Social learning is a step by step process, taken by different actors. And then, suddenly, two hours had gone by … As you can see there were so many interesting ideas it was hard to record them all accurately. I did the best I could but am sure I got some of it wrong. Feel free to add corrections or thoughts in the comments. The Mobile City and Virtueel Platform organised a workshop and conference titled Social Cities of Tomorrow. The program took place during the week of February 13-17. It was a great event in every way from organisation to the keynote speakers to presentations of different social media projects from throughout the world. Not only that, but it was fun and there were lots of great people doing great work to meet. See also my posts: Social Cities of Tomorrow Project Showcase and Social Cities of Tomorrow Workshops. Keynote presentations at the conference were given by Martijn de Waal from The Mobile City, one of the conference sponsors, Usman Haque developer among other things of Pachube, Natalie Jeremijenko, an engineer and artist, and Daniel Hill, an interactions designer from SITRA (Finish Innovation Fund). More details on the keynote speakers is available at the Social Cities of Tomorrow Keynote Speakers page. Martin’s presentation was an introduction to the idea of the conference and overall project. I am pretty sure he worked on it closely with Michiel de Lange, his colleague at The Mobile City, who did an excellent job as moderator of the conference. Starting with the title, it’s a take on Ebenezer Howard’s book “Garden Cities of Tomorrow” which was designed to address the problems of turn of the century (1900) industrial cities through improved physical design. The idea now is to use new technologies to create communities that can solve today’s complex issues. The goal is to have highly technical cities, but focused not on technology, but on people. People living in cities should feel an ownership, meaning not that they exclude other people, but rather that they feel responsible for improving their cities. New media allows us to organise people in new ways, e.g. collaborative consumption (e.g. car-sharing, airBnB). Lots more ideas from Martijn’s presentation available at Social Cities of Tomorrow Background and his presentation is on line at: placeholder. Usman started by reminding us that cities are a place for encountering things you don’t understand, and this is a very good thing. Pachube, the website started by Haque, is an organised list of data feeds from throughout the world. Anyone can add a data feed. The goal is to be a broker for the data from the internet of things. The site serves to promote discovery of data feeds and to begin conversations about what the data means. The growing number of sensors and feeds means that we are flooded with data, but how does this lead to action? The first step is to enable people to make sense of the data. Two ideas: (1) we need to have/encourage people to have conversations about the data; and (2) we need to develop applications to make sense of the data. Haque also described a project where architecture students in Barcelona collected air quality data by wiping kleenex on the sides of buildings and recording the amount of grime they found. Pretty inexact, but quite effective in making the students aware of what they were breathing. Once they saw what was going into their lungs they were ready to take action (they developed a new air circulation plan for their workspace). The main point is that taking action requires more than technical data, it is a function of culture and politics. Haque ended by suggesting that perhaps we shouldn’t always be trying to simplify things, maybe it’s better to demonstrate complexity and develop tools to deal with that complexity by connecting with people and taking action together, shouldn’t we embrace complexity? Haque’s website describes many of his extremely interesting projects. Natalie Jeremijenko had the difficult task of talking with us after lunch, but succeeded in keeping us wide awake as she described many of her projects. I’ll just mention a few. The goal is using new media to create a better future. Generating, analysing and acting-on data needs to be opened up. An example from transport, a traffic signal gives power away to the machine, a traffic circle makes everyone use data to make decisions. No Parks are small parts of the street where plants replace pavement (cars can no longer park there). The goal is to reduce the surface runoff that is a very significant problem for water quality (it’s easier to deal with point sources and regulations have reduced point source pollution). She described an effort in NYC that included individuals taking ownership for these little “No Parks” by selling pieces of the plot and using the proceeds to pay for the project. Many cities are doing projects to open up the pavement in this way, but I have not seen any that use this level of social engagement before. Bike Messenger – LEDs on bike wheels connected to a wireless communications. When bikes reach a certain speed the LEDs light-up and display information communicated by roadside senders, for example the number of pedestrian fatalities at the intersection. Good information for everyone and helps make the bikes more visible at night. Fightpath Toronto, a really wild project where Jeremijenko and Haque set up aerial platforms in front of the Toronto City Hall and let people fly through the open space (connected to cables, although they wore wings). As the people “flew” laser lights were projected that changed based on the sound of the audience. When’s the next installation? I’m going! Elevator Project, Long Island City for Otis Elevators (?). Jeremijenko looked at how by extending the elevator shaft 30-feet above the building roof, the shaft could help provide better air circulation and help power the building. It also gave the opportunity for installing flightpath take-off areas (platforms for installing the cables) which might even be used for goods delivery (why does an organic artisanal bakery need to use diesel belching trucks to deliver its products?). Here’s a couple sites with information on Natalie environmental health clinic and NYU faculty bio. 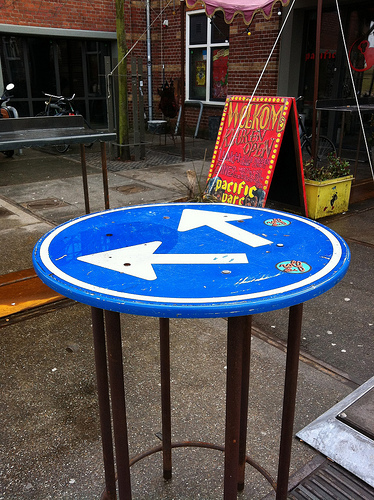 Old traffic sign used as a table in Amsterdam. Daniel also had a tough job, it was getting quite late on a Friday afternoon, but his talk was also mile-a-minute speed through a series of ideas and lessons learned. The main point of Hill’s talk was that designers normally only deal with a small portion of what’s going on with project implementation. There’s a great deal of “dark matter” that isn’t normally dealt with by designers which impact what gets done and what doesn’t much more than actual designs. But someone created this context (in the 18th Century for 18th Century problems), and so it can be recreated. But how? Government 2.0 is not Government 1.0 with a web 2.0 front end, there needs to be more. 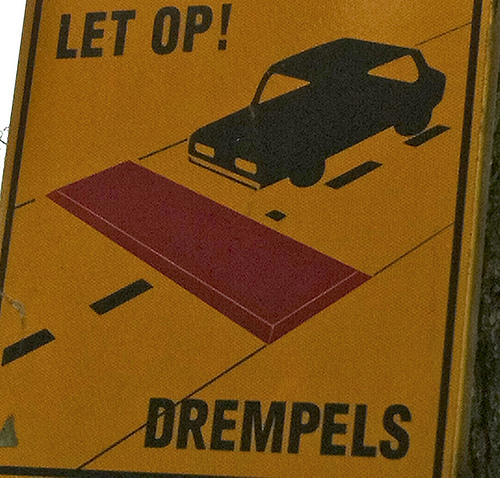 Speed bump sign in Amsterdam. Hill mentioned Ravintolapäivä the original restaurant day (http://restaurantday.com). It’s a day held in Helsinki where anyone can open a restaurant and serve food to the public. It’s totally illegal, but the government was powerless to stop it. Now it happens twice a year, organised on Facebook. The next one is May 19, 2012. This was an example of how the “Nordic Model” (of providing the same for everyone) could be meshed with the “Anglo Model” (wide variation and diversity) to provide the high overall quality of the Nordic model with the creativity and innovation in the Anglo model. A possible project is for the city to create an place where people who want to start restaurants can learn the skills needed to do so successfully, hopefully without squashing out the creativity these people bring to the project. Turning this from an intervention to a systematic approach for supporting creativity and innovation. The world is mutable – although policy makers often don’t think things can change: they can. Prototype in the political world, the cost of assessing the risk of doing something new is often higher than the cost of just trying it and failing. For more on Dan Hill see his blog city of sound, well worth a read. Keynote speakers at Social City of Tomorrow Conference Amsterdam 2012. 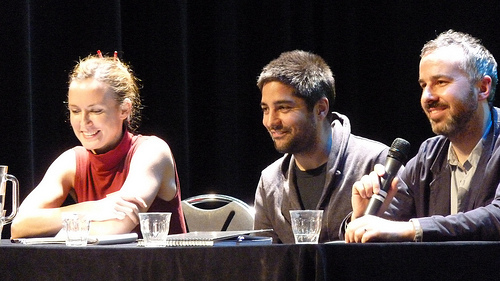 The keynote speakers at the panel discussion: left to right: Jeremijenko, Haque and Hill, source: Virtueel Platform. Everyone agreed that dealing with the dark matter was a fundamental part of getting projects done. Jeremijenko reported that there was no precedent for her AgBags project, so she had to print things on the bags so they would be considered “signs” and could therefore fall under the city’s regulatory structure. Seven agencies needed to give approval for her fish lights project, and unfortunately, none of them really helped implement the project, they just gave approvals. Someone made the point that designers are lucky in the sense that they usually have a client who gives them instructions (design a building for me) so lots of the dark matter is dealt with by someone else (the lawyers), but it’s really these things outside the traditional “client-designer relationship” that really need changing … in that sense design-think is dead. Technology enables, it does not drive change. There’s a tactical benefit to new technology: often institutions don’t have a standard way of dealing with it, so there’s an opportunity to really change things. … and with that we adjourned to drinks and conversations.